hair that is so highly associated with Super Saiyans. They look way too similar for it to be a coincidence, so fans were curious about the story behind the card and have taken to sharing it between the fandoms. The story goes that there was a fourteen-year-old anime fan by the name of Tyler who wound up developing a form of liver cancer. He had to undergo risky surgery in an attempt to save his life and wound up needing to have a large amount of his liver and portions of his other organs removed, but did survive. To celebrate his triumph, Make-A-Wish worked with him to indulge in his passion for anime by getting him an opportunity to design a Yu-Gi-Oh card. 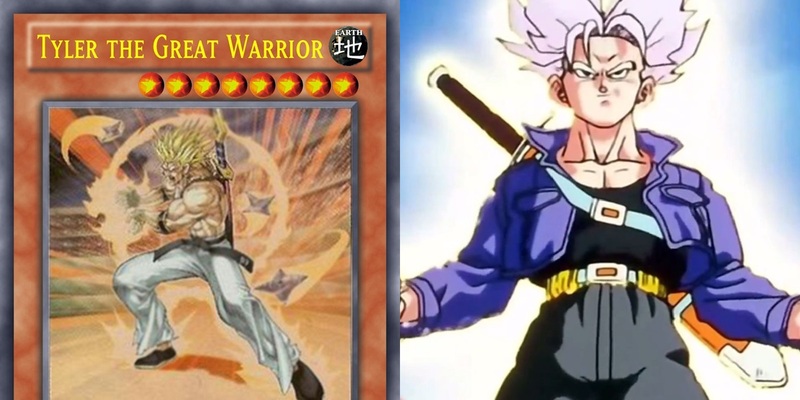 And apparently Tyler was also a fan of the Dragon Ball franchise, because the character he drew was someone very much like Trunks, and the card was named in honor of Tyler.